Loading bit code to the FPGA. Once you got a working .bit code in the simulator, it's time to synthesize it to load the design to the FPGA. In this case we load a given code to the Spartan 3-E Starter Kit using the ISE developer tool. First the painful part. 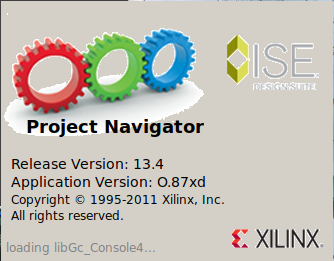 You must download ALL of the Xilinx ISE application to develop in FPGA. That thing weighs an average of 14? GB or something, online. So if you got a slow connection, it will be a pain. To do that, go to the Xilinx page and seek the ISE. You can do so HERE. Follow the installation procedure and place it in a folder you won't use much. 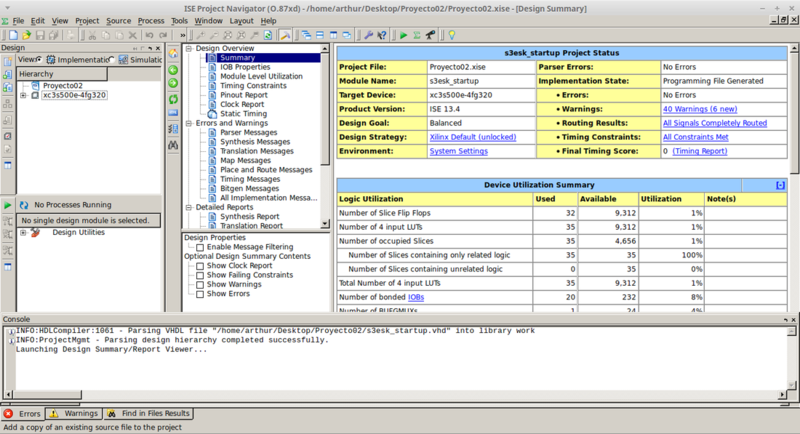 I placed mine in a Programs folder as shown on Figure 2. The application can be selected from command line as shown. One of my main complaints is the disordered nature of the software so I suggest you make a .bashrc in your computer to access the application without having to move all the way from home. Learning to write bash files really pays off in the long run. We test the application typing the command ./ise in the command line either in the directory where it's installed or anywhere if you included it on the .bashrc file. If it worked well, we'll find the cluttered mess that's the ISE editor. Next thing you need in order to load the .bit code to the FPGA is to configure the ISE and the computer to recognize our device. 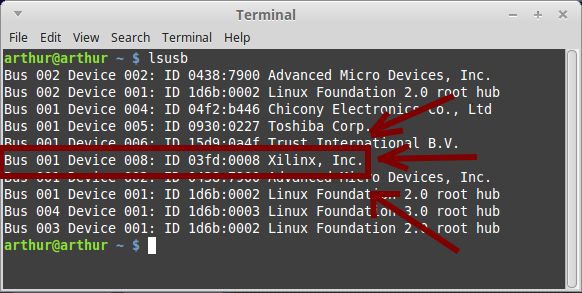 Sadly Ubuntu doesn't recognize the FPGA straight from the box which makes it necessary to load the necessary USB drivers. Then we need to configure the rules files using either Gedit or your favorite text editor. It can be Vim, pico, nano or whatever you prefer. Once we have it configured, we need to copy it to the computer's rules directory. We must locate the .hex files with the command. And copy the files to the folder /usr/share. Finally we must restart the udev file with the command. the vendor's tag should appear in the list of connected devices as shown on the figure.